Hunters, Read This Before It’s Too Late! Okay, this isn’t actually an emergency. But it IS one of those things that needs to be said early in the hunting season. Read on. As many of you know, I’m a huge fan of Hank Shaw, celebrated author of several outstanding wild game cookbooks and my go-to source for anything related to cooking wild game, foraging or fishing. About a year ago, as I was leafing through my copy of Hank’s cookbook, Buck, Buck, Moose (available at Amazon, walmart.com, and Barnes & Noble) I stumbled upon several recipes that really piqued my interest. Unfortunately, the recipes required venison shanks. It never really dawned on me that I wouldn’t have the correct cut of meat needed to prepare the feast. I’ve always been a huge proponent of using every inch of any animal that my Deerslayer harvests. And yet I stood in front of an open freezer looking for a key ingredient that I didn’t have. Thus the warning! Don’t toss those shanks away. If you know that a delicious meal can be had, why would you? These are the fore and hind shanks from one animal. They provided 2 meals. 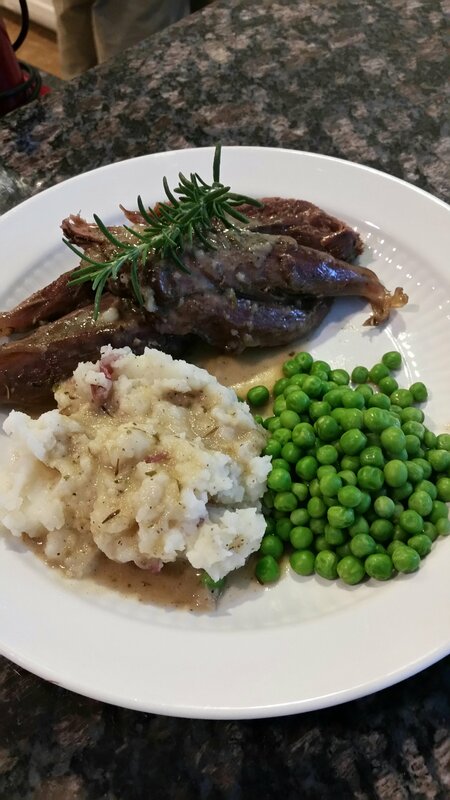 The recipe that I decided to try was Hank’s Braised Venison Shanks with Garlic. You can find his recipe and directions here. The recipe calls for the shanks to be browned on all sides (except the shin side) in a container large enough to hold them. That was tricky. The only thing I could find large enough to accommodate the shanks was my turkey roaster. I have to admit that it didn’t work great because it doesn’t conduct heat like cast iron but it got the job done. Because of the width of my turkey roaster, I doubled the ingredients needed for the braising liquid. 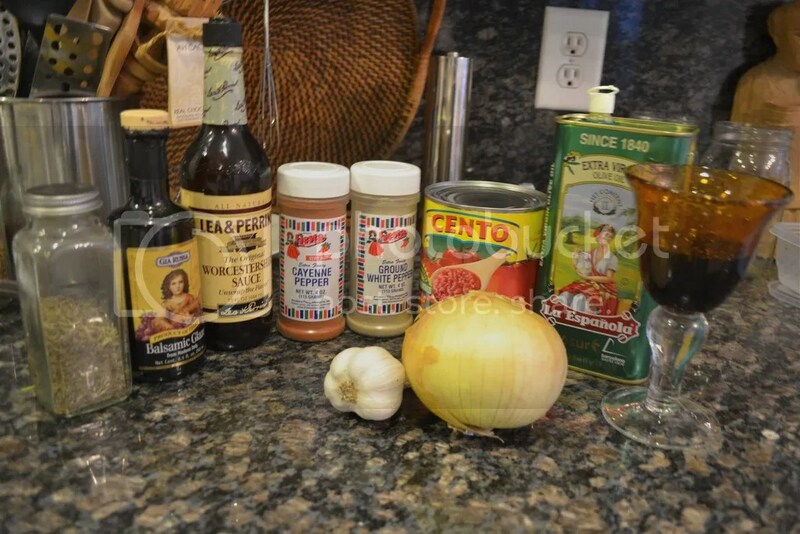 It turned out for the best because the braising liquid is then used to make a sauce that is superb! There was sauce left over. You’ll want to use it on leftovers, pasta, anything. Everything fits and it’s ready for the lid. The meat is on a cookie sheet ready to be basted with the sauce I prepared and glazed in the oven for some more time to optimize the roasted garlic flavor. The masterful photographs that accompany Mr. Shaw’s recipes are beyond compare. When I tried to serve my shanks “on the bone”, they rolled off the plate and made a mess. I cut the meat from the bones, which didn’t make as beautiful a presentation, but saved my tablecloth… and rug and clothing. 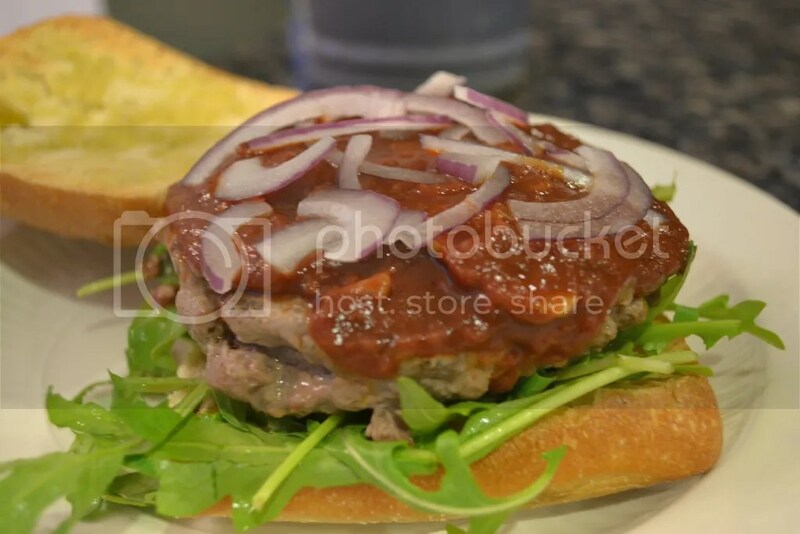 An outstanding dish…. loved by all. Save the leftovers. I have another recipe for them! It’s really hot outside. And, yet, it’s time to start preparing for deer season. It’s time to fill feeders and fix feeder pens. And check on the game cameras. It’s time to clean out coolers. For the Deerslayer’s Wife, it’s also time to start thinking about meals that can be packaged up ahead and prepared in a jiffy but still be worthy of the hunter that made them possible. Enchiladas are great because they can be prepared ahead, frozen, packaged, and served a few at a time depending on how many you need. The cookie sheet can be placed directly into the freezer for a few hours until the enchiladas are frozen through. ….and labeled to store until needed. The trick to having fresh (not soggy) tasting enchiladas is to package up the sauce separately, heat it, and pour over the enchiladas before they are heated in the oven or on a bbq pit and served. Sauce can be made and poured up into smaller jars that can be taken, in a cooler, to the hunting camp. I’ve used canning jars and larger plastic containers with screw-on lids. I’ve taken several varieties on hunting/camping trips, Venison/Wild Pork Enchiladas with Creamy Poblano Sauce, Cheese Enchiladas with Venison Chili con Carne, and Pheasant (or Duck or Chicken) Enchiladas with Tomatillo Sauce. This recipe is kind of a variation of a couple of the others. It has all the flavor and cheesy appeal of cheese enchiladas with the extra heartiness of a meat filled enchiladas. Everyone really enjoyed these so I thought I’d share. I always prepare enough to serve as dinner the night I fix it and freeze the rest for an upcoming hunting/camping trip. In a cast iron skillet, season shredded venison and/or wild pork with chili powder, comino, and salt to taste. 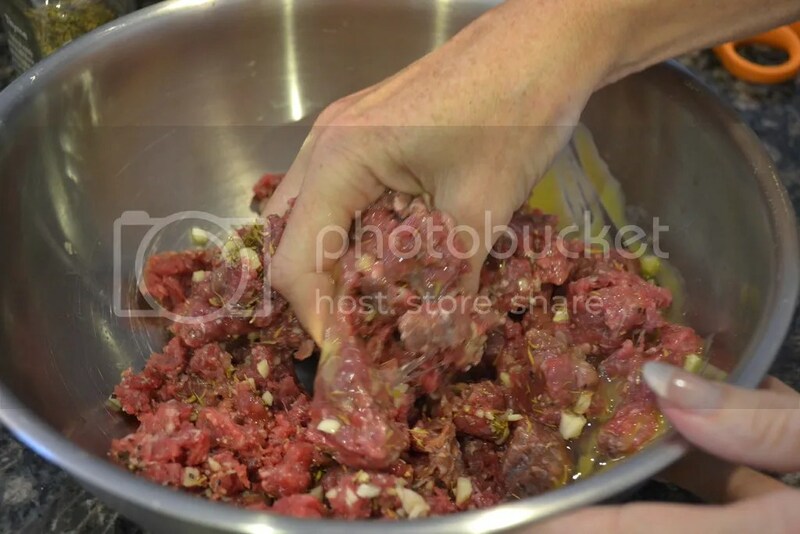 Add enough stock or drippings to moisten the meat a little. In a separate small skillet, heat about a 1/2 inch of cooking oil. When oil is just starting to shimmer, coat one corn tortilla, one side at a time, until tortilla is soft, just a couple of seconds. I discovered these great rubber-tipped tongs that do not tear the corn tortillas! Priceless! Lay corn tortilla on a flat surface. 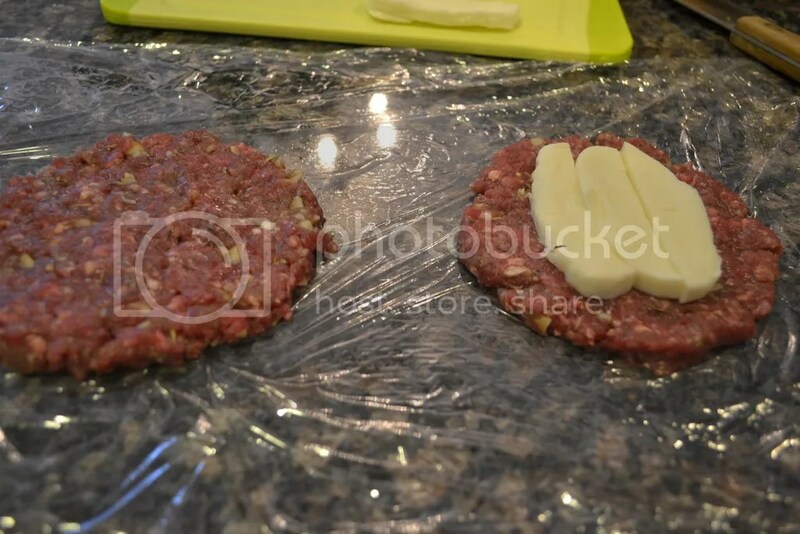 Spread with a line of seasoned meat and cheddar cheese. Continue this process until you have rolled as many enchiladas as you have meat. If you want, set aside the number of enchiladas you want to cook for a meal right away. Then place the rest of the enchiladas in the freezer for several hours until frozen through. Melt the bacon grease in a cast iron skillet, saute all veggies until translucent. Add remaining ingredients, stir, and simmer, covered, about 1 hour until tender and cooked down to thick gravy. Stir periodically to prevent sticking to the pan. Using an emersion blender or regular blender, blend sauce until smooth. At this point, you can pour what you need over your enchiladas in an ovenproof dish, sprinkle with remaining cheese and bake at 350º for about 30 minutes until bubbling and cheese is melted. 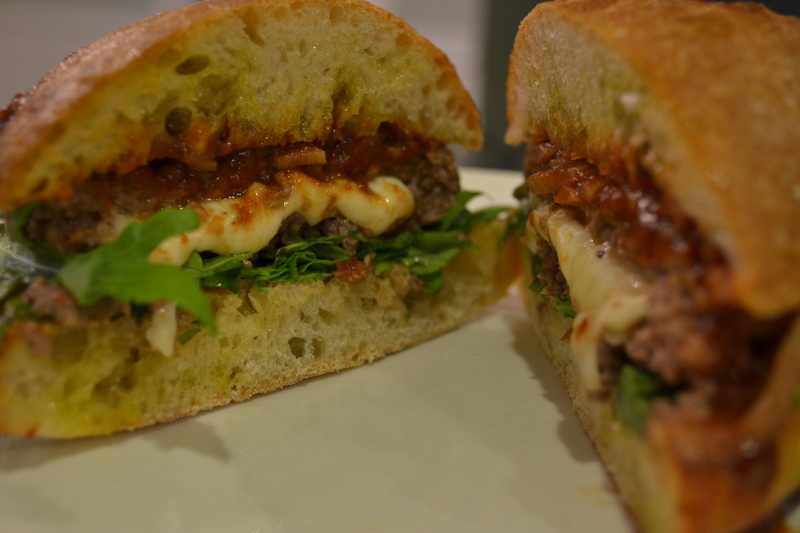 Pour extra sauce into jars to take on your hunting trip. For a hunting/camping trip, preparing a meal that has as little cleanup as possible is almost always my goal. Multi-packs of small foil pans are readily available at most grocers these days. 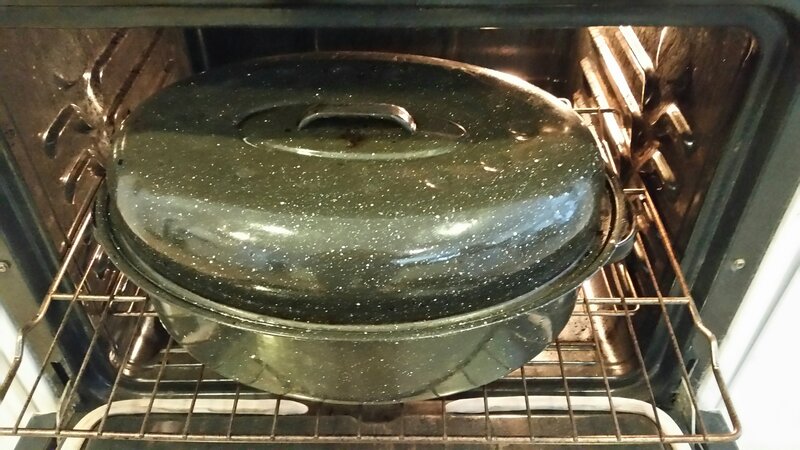 I have discovered that enough frozen enchiladas (thawed) for a meal can be placed in one of these aluminum baking containers, heated sauce poured over the top, and cheese sprinkled on. Cover and seal the pan with additional foil and place on a bbq pit off to the side of some medium hot coals for about 20 minutes or so depending on how hot the coals are. The pan should be turned a couple of times for even heating. Check the progress. The enchiladas are ready when the sauce is bubbling and the cheese is melted. When it comes to food and the important role that it plays in our lives, it is not surprising that some foods seem to form connections in our minds with events and special times. Bar-b-que and beer make most people think of outdoor get-togethers with family and friends, laughing and telling stories. Mexican food and beer… same. Football and hot wings. Hotdogs and baseball. And for many, quiche conjures up images of brunch… with mimosas… and ladies in hats. No deer slayer in his right mind would be a part such a scenario. But throw some wild pork sausage into the mix, and his interest will be piqued. Suddenly quiche is transformed into a hearty and savory manly meat and egg pie. Perfect for a Father’s Day breakfast. It’s all in how you present it. 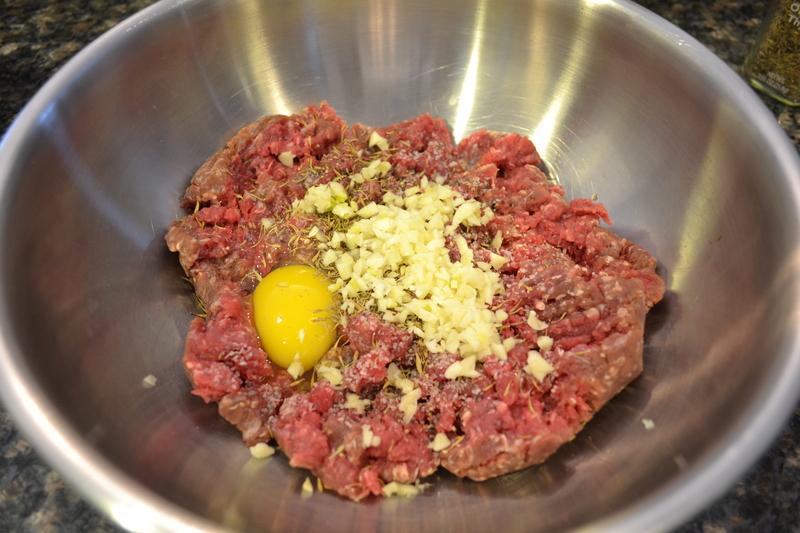 This recipe allowed me to use some of the 55 pounds of ground wild pork in my freezer. My experimentation with wild pork pan sausage began with maple pan sausage. 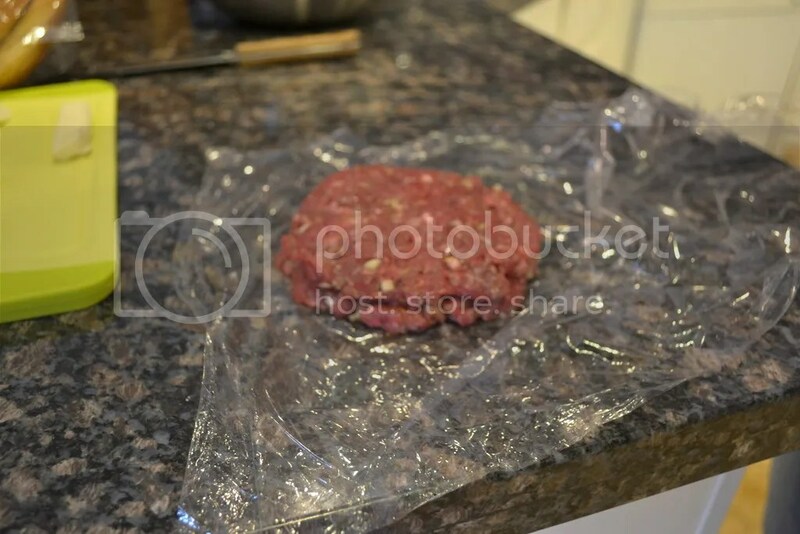 Because I use my one-pound packages of ground pork for a number of recipes, I never know if I’ll want it for pan sausage, or to mix with venison for burgers, meatloaf, or lasagna, or some other new recipe. With that in mind, I season up my wild pork sausage one pound at a time as needed depending on whether I’m in the mood for maple, traditional with sage, or Italian sausage. That way, I’m never left with a freezer full of the wrong sausage for my recipe or mood. I photographed the Sweet Italian variety (which is great) but for this recipe, I actually used the “regular” flavor, with some added rubbed sage. This recipe has 3 steps; preparing the sausage, preparing the crust (or use a prepared crust), and preparing the filling. 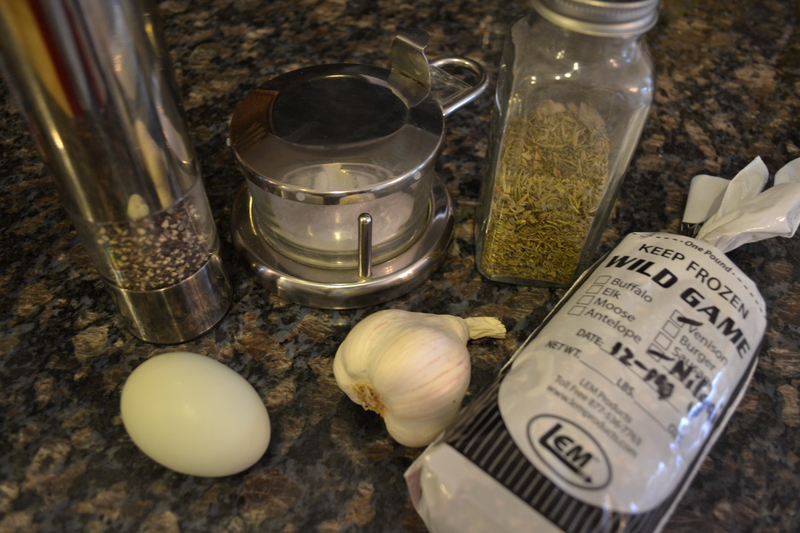 To start this recipe, I mixed up a batch of LEM brand traditional sausage seasoning with my ground wild pork. Although the instructions suggest 2 teaspoons from the seasoning packet, I found that 3 produced the intensity of flavor that I was looking for. In a small glass bowl, I mixed the seasoning, 1 tsp. of dried, rubbed sage, and about an eighth of a cup of water. I poured the mixture into the ground pork and worked it in with my hands until the seasonings were fully incorporated into the meat. Then I cooked up the newly prepared sausage in a skillet and set aside. For the crust, combine the flour and salt in a bowl. 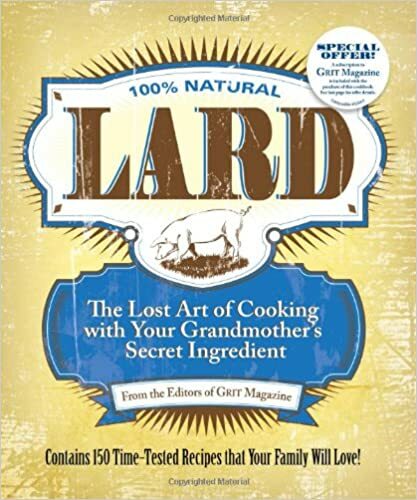 Using a pastry blender, two butter knives, or your fingers, cut in the lard until the mixture is a very fine crumble, about the size of peas. Sprinkle the cold water over the mixture and combine just until the mixture sticks together..Form the dough into a ball and press into a disc. 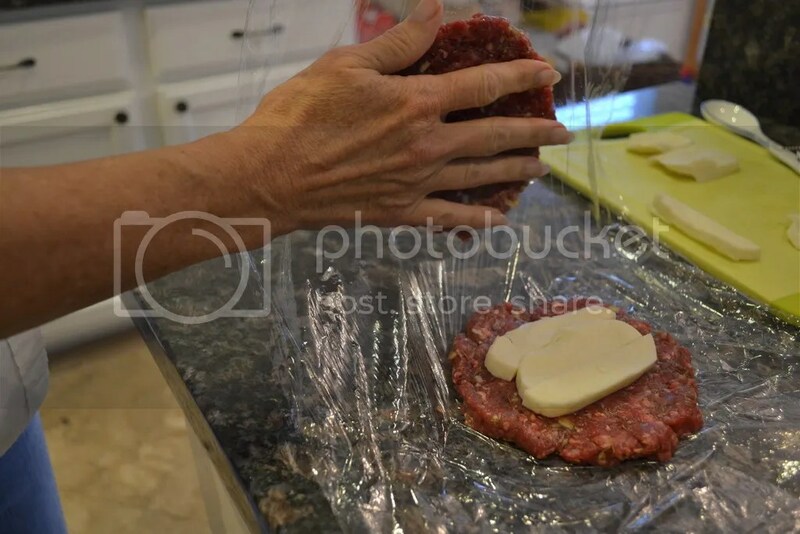 Wrap the ball in plastic wrap and refrigerate for about 30 minutes*. Prepare a work surface by sprinkling with flour, and roll out into a disc that will fit your pie plate. I always lay a sheet of plastic wrap over the dough as I roll it out. It gives me more control and allows me to lift the dough more easily into the dish and press it into place without tearing the crust. Trim excess from around the edges and place in the fridge until you are ready to add filling. 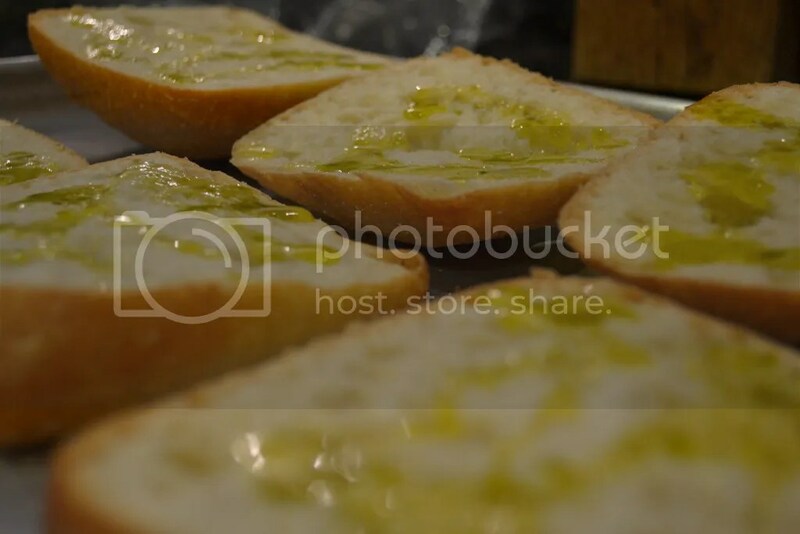 Heat olive oil and butter in a cast iron skillet. Add chopped onion and mushrooms and a sprinkling of seasoned salt. Use sparingly since the sausage is quite flavorful. Stir ingredients around until onions are almost caramelized. Spread onion and mushroom mixture over the bottom of the prepared crust. This photo is actually from a previous cooking session. The sausage is under the mushroom/onion mixture which is why the quiche is soooo full. Sprinkle cooked sausage over that. There will be sausage left over. That’s okay! Use any extra in breakfast burritos! Combine eggs, half & half, and grated cheese. Beat with a fork. Pour over other ingredients until full. Place quiche on a cookie sheet and put in a 350° oven for 25-35 minutes or until set and browned on top. There are days when just getting out of bed seems like a major achievement. As I stagger to the kitchen whimpering for a cup of coffee, a pile of bills waits for me on the table. I wade through waist-deep laundry to get to the the freezer room (yes, we have a freezer room! My husband is the Deerslayer, remember.) to decide what to fix for dinner. I stare, bleary-eyed, at the contents, waiting for something to jump out at me, something so easy to prepare that I can whip it up in no time and still come out looking like a Homemaker Extraordinaire. Do you have days like that, too? Quite by accident, I stumbled upon something that fills the bill, if you will. A couple of years ago, Deerslayer had a great year hunting wild pigs. There was plenty of very welcome wild pork to fill our freezers. We ground a whole bunch of it, and had several roasts and tenderloins. I was a happy camper. Deerslayer asked if he should keep the ribs. Keep in mind that wild pork ribs aren’t the same size as the ones you get at the market, much smaller. But, what the hell, said I! So we packaged up quite a mess of ribs, as well. I’d been wondering for a while if I could cook the ribs in the oven like I did in my post from March 22, 2013, freeze them, label them, and toss them on the pit just long enough to impart the smoky goodness at the last minute. I decided to give it a shot. I seasoned the pork ribs very liberally with Tommy’s Salt & Pepper mix, tossed them in my covered roasting pan with a can of Dr. Pepper poured over, and braised them for approximately a couple of hours at 350 degrees, turning occasionally, until the meat just about fell off the bone. I was able to pull the bones right out of the ribs. The slabs stayed intact, however. Sorry for the bad lighting. The meat wasn’t quite that grey. Then I packaged up the fully-cooked meat, labeled it, and tossed it in the freezer. When I was ready for a speedy, great dinner, I thawed out the meat, started some charcoal in the BBQ pit and worked on my side dishes (red bell peppers to grill, some garlic to roast, and some cole slaw). I put the ribs on the grill just long enough to heat them through, and slathered them with my favorite BBQ sauce. I tossed some red bell peppers on as well after I removed the seeds, opened up the peppers to lie flat, rubbed them with olive oil, and added some Salt & Pepper mix . Meanwhile, back in the kitchen, I took a slew of garlic cloves (pre-peeled from Sam’s Club), tossed ’em in a cast iron skillet with a little olive oil, and allowed them to roast until lightly browned and soft. Pretty damned tasty! Most of them were eaten right out of the skillet before I could even get a picture!